Culture Change and "Big Hitters"
When we think of leaders, we typically imagine an individual or individuals who are positioned at the top of a hierarchy—or “positional leaders.” While CSSR recognizes that this traditional definition of leadership exists in most organizations, and that effective “positional” leadership is, indeed, critical to school change, we recognize a broader definition of leadership that is shared and distributed. What we learned time and again is that leadership can pop up in the most surprising places in an organization and that leadership “density” can greatly accelerate the change process. In the i3 New England Network, we saw exemplary leadership emerge in teachers, site coordinators, administrators, students, parents, and community members. Having leaders across the organization and community is perhaps the most effective way of ensuring that change will “stick” because many people own it. Shared leadership focuses on fostering communication, cooperation and collaboration in an organization, and is built on a commitment to realizing both individual and organizational goals. Students – students are fully engaged in school change and viewed as partners in the redesign process—having a role on most leadership teams. Compelling Vision – all stakeholders are working in unison towards common and innovative student outcomes. Collaboration – formal mechanisms are in place to provide the entire school community with regular opportunities for structured collaboration. Influence and Energy – school leaders prioritize initiatives and best practices in a way that structures energy and influence towards the activities that have the greatest impact on student achievement. Capacity Building – teachers, students and administrators are not only focusing on tangible classroom practices, but also cultivating the intrinsic behaviors that will sustain change and continue to develop relationships over time. Developing leadership skills amongst stakeholders happens over time – not through one or two workshops or trainings. It requires an adaptive philosophy and an ability to mobilize people to meet a set of goals and embrace a set of challenges. We have learned that tending to the little habits, routines, practices and processes, and systems of student-driven learning builds people’s sense of efficacy, and can spark significant changes in the school culture. Simply designating individuals as leaders, without directed professional development to give them the tools and authority necessary to act on their own, will do nothing but create resentment and chaos. Thinking Influence – helping examine their habits and routines, and creating a framework for what must be done on a regular basis to change the thoughts, feelings, and behaviors of others. Thinking Energy – helping leaders understand how their habits and routines, when put into practice, influence the culture as a whole and create a purposeful system of implementation. Effectiveness relies on the leader and his/her teams’ ability to manage how their level of energy is used so that the team is not spread too thin and energy doesn’t become depleted and/or wasted over time. John Kotter, of the Harvard Business School, suggests that the “central issue at first is never strategy, structure, culture or systems. The core of the matter is always about changing the behavior of people.” (Deutschman, 2005). Not to discredit alignment of strategy and structure for long-term sustainability, CSSR understood that successful school redesign begins with relationship and trust building. We also recognized that each school needed the autonomy to move at its own pace and implement strategies in a way that would meet their own unique needs. It is important to note that the strategies below looked very different in each learning environment and evolved over time. When the i3 New England Network was launched, each school designated a Site Coordinator who would serve as the project manager in each school and liaison to the project management team. Over the five years of the project, however, a far more substantive leadership role emerged. Some Site Coordinators were classroom teachers, others were principals, but they all became leaders and agents of change. They pushed the envelope when encountering resistance, became true owners of the change process, and influenced their colleagues. Infrastructure and leadership capacity building are required to support major culture change efforts. They provide the “how” for the “why and the what” of effective student-driven best practices, and are most responsible for the successful implementation of student-driven approaches to teaching and learning. The following best practices provide stakeholders with a general roadmap for capacity building and support the design, development, implementation, and sustainability of the school redesign process. They are meant to be customized to the specific context of each school. The Discipline of Culture Change – Discipline is required when making change. It involves both values and specific skills. The three most essential values are respect, collaboration and ethical behavior because they shape an environment where trust prevails and stakeholders fully invest in the change goals. It is important to assume a stance of active listening. Focusing & Optimizing What is the Most Important – This may seem obvious, but the multitude of demands and initiatives found in schools create a kind of “initiative fatigue.” It is essential to understand what initiatives will produce the best results, and then focus resources on doing those few things very well. All stakeholders, including students, should be part of the conversation about priorities. Communication & Buy-In – It is a rule of thumb that if a project is not encountering resistance it is not changing anything! Therefore, leaders must continuously communicate for influence, not just to transmit information. Conversations across the school unearth an understanding of stakeholder need and resistance; they reveal the communication work that needs to be done because without clear and ongoing support of the majority of stakeholders, the work does not endure. Team Development – Strong teams are essential to drive and sustain change initiatives. Teams engender buy-in and provide the supporting structure for the courage to make tough decisions and stick with them. Teams are the incubators for change! It’s important to set aside the time for team development; it simply doesn’t happen on its own1. Purposeful Staff and Professional Development – The number one predictor for job satisfaction and productivity is job/role clarity. Having a clear picture of what is expected, along with the skills, knowledge and abilities to implement one’s role with fidelity will optimize performance. This applies to both one’s individual role within an organization, as well as to the role of teams within an organization. Any new practice requires that those implementing it have new and enhanced skills to be successful. Over time, the development of a professional learning community becomes a game-changer, as leaders learn to reflect, refine and revise. Just as students must keep learning, so must all other stakeholders in a school. It’s easy for school leaders to get caught up in the day-to-day details of running a school or classroom. As a result, they may not be able to see the forest through the trees and may feel enervated, as opposed to energized, by their work. The mere idea of change often stokes fear, along with the mindset of “we can’t do that here, with these kids.” By participating in the i3 New England Network, stakeholders were given the time and space to step back and imagine the possibilities of how a different kind of learning environment might better support student learning and development. At the conclusion of the second year of the grant, CSSR partnered with inquiry specialists from the Francis W. Parker Charter Essential School – a small secondary school focused on performance-based assessment and personalization of student learning, founded by the late Ted Sizer, founder and long-time director of the Coalition of Essential Schools. Diane Kruse (STEM), Ruth Whalen-Crockett (World Languages) and Lorin Hill (Science) – all current classroom teachers – became mentors and content experts for the i3 New England Network. Through their mentorship, teachers were able to connect inquiry theory with content specific best practices. Diane and Ruth allowed teachers to visit their classrooms at Parker and provided training both at Parker, and at the project sites. They helped teachers build skills to look at student work, facilitate structured conversations using protocols, and evaluate core competencies. In 2010, CSSR created a Readiness Assessment to better understand what is working purposefully and well in schools, and uncover areas for growth and improvement. The results of a Readiness Assessment were used in the i3 New England Network to create a Network-wide professional development plan that balanced school-specific best practices with practices that could generalize to the project as a whole. The Readiness Assessment process revealed that the professional development opportunities that were most essential to school change were in the areas of student voice and choice, collaborative skills and practices, performance assessments, and project-based experiences like Extended Learning Opportunities and Senior Projects. It is one thing to read what best practices look like in other schools and districts, but quite another to understand your own stakeholders. Student shadowing is a highly effective method for understanding the daily experience of the “customer.” The shadowing experience creates a set of faculty/student pairs for a day, during which time the faculty member’s job is to follow the designated student as he or she goes about the day—in the classroom, in the cafeteria, in the school corridors, etc. This exercise builds a deep empathy for the student experience that is otherwise unattainable. When student shadowing takes place early in the change process, it typically reveals evidence that much work remains to be done. The experiences ground constructive conversations about the need for change, and allow stakeholders to point to “live” examples of success, as well as inequities or areas for growth. It organically lays the groundwork for all of the work that follows because it’s grounded in the reality of the school environment. Perhaps the most powerful aspect of Student Shadowing is the debriefing at the end of the day. At Manchester West, for example, the debriefing stimulated substantive conversation about the workings of the school and enabled those most resistant to change to examine the facts on the ground. Virtually every school in the country is spread too thin. Initiatives and mandates pile on over the years, and there is rarely an opportunity to step back to reflect on what’s working and what’s not. The goal of Initiative Mapping is to help key stakeholders identify, focus on, and allocate the appropriate energy and resources to those efforts - programs, initiatives, and best practices - that drive positive learning outcomes. The activity’s purpose is to identify where time, resources, and energy are being spent. Initiatives are defined here as any activity that is new, or reflects efforts to enhance existing processes, programs, or practices. The Mapping process provides a clear snapshot of how well programs and practices are aligned toward a common purpose. It also reveals the amount of time spent on efforts that may not be delivering on their promise, which often jumpstarts a much-needed conversation about priorities. If done well, what is the impact on student achievement? Is the practice high yield? What is the current level of performance? What is the current level of resistance? What level of energy is needed to implement? Is the initiative mandated by local or federal policy? Who “owns” the initiative’s ultimate success? After groups answer these questions, the Mapping process takes place where each one is ranked, prioritized, and graded against its current level of proficiency. The findings are always eye opening. Schools and districts begin to better understand that they are not managing their influence and energy in ways that will benefit students. Of the more than 100 initiatives that are usually in front of school leaders, very few are advancing learning outcomes to the degree necessary for student success. Analysis and reflection forces a discussion about time, energy, and attention—enabling schools to become more purposeful. Teams are critical for shared leadership and an important engine for change. Most schools have too many teams, and they often function at a mediocre level at best. There is an enormous difference between a high-performing team (HPT) and an ad hoc task team, or a team that lacks a formal structure and charter. HPTs are characterized by the discipline that comes with a formalized structure, policies, and procedures. By this definition, most schools do not have HPTs. Below is a sequence for creating HPTs that CSSR finds to be highly effective. Create the Team & Develop the Purpose: In each school of the i3 New England Network, two high performing teams were created to serve the redesign process. The Change Leadership Team’s purpose was to develop and implement key organizational processes and structures that would help support the implementation of change. The Authentic Assessment Team, consisted of teachers and students, and was tasked with examining student-driven best practices and classroom strategies to improve learning via inquiry-based instruction and competencies. Develop the Infrastructure: Each team developed charters identifying core values and actions, behaviors, and practices around which to organize themselves. Team facilitation was important, and a set of skill-building sessions around facilitation ensured that the work got accomplished. Check Alignment and Prepare to Get to Work: The HPTs were a strong mobilizing influence in each school. In some cases, a small and isolated group of practitioners was able to plant the seeds in such a way that invited their colleagues to the table. In other cases, schools decided to create one leadership team consisting of representatives of both the Change Leadership Team and the Authentic Assessment Team. Across the i3 New England Network, schools realized the value of HPTs to align and integrate their work. Sustainability is about fidelity of implementation. It requires that school stakeholders closely examine their best practices and determine how they will continue their work beyond the grant-funded period. To support schools on this path, CSSR designed a “sustainability training” to clarify strengths and limitations, and recognize how best to continue the work. The goal was for the i3 New England Network schools to say: ‘This is how we now do business.’ According to CSSR’s Bill Bryan, the purpose of the workshop is to provide school leaders with tools that could be helpful beyond the grant, and to support them in creating an action plan. Continuous improvement is the underlying value of sustainability. Cross-district work came in the form of three intentional learning communities: The Performance Assessment Working Group, the Performance Assessment Review Board and the Summer Institute. Through these ongoing communities of practice, shared leadership emerged, as team members refined their skills and owned the change process together. Cross-site work then carried over to the school-based teams, as members of the i3 New England Network were more comfortable leading change in their own schools. The work of the i3 New England Network revealed two key lessons about leadership in general, and about shared leadership in particular. 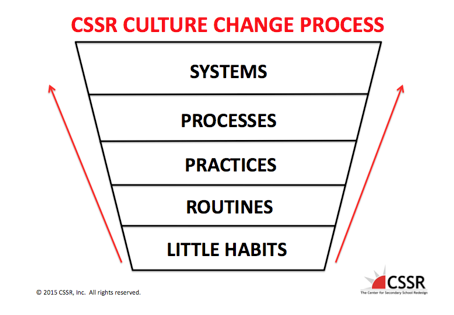 First is that culture change takes time and doesn’t happen in a linear fashion. Second, if leadership is shared across the organization, change may well be happening beneath the surface, but not become visible for some time. Fortunately, the five-year grant provided the time necessary to embed new leadership practices in the schools. It is important to know that much of the progress was only fully manifested in the last two years of the grant. Shared leadership helps create the conditions that enable people’s authentic voices to be heard and unleashes not only individual genius, but also the collective genius of the school community at large.